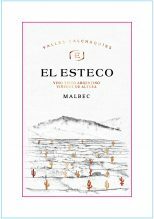 Vinification: The El Esteco range of wines is oriented to have a personality of great finesse and complexity. Concentrated bunches of small grains are manually harvested early in the morning and put into small bins of 18 kg. Pre-fermentative maceration at 5°C in stainless steel tanks and gentle treatments are carried out during alcoholic fermentation. Utilization of both native and selected yeasts for the fermentation process. Post fermentative maceration total 25 days. Natural malolactic fermentation is carried in both american and french barrels of first, second and third use. Finalizing this process the wine is aged in both American and French barrels for 12 months. A careful selection of barrels is made, looking for light toasted oak in order to accentuate the freshness of the fruit. The wine is bottled unfiltered, and kept at the winery during 6 months. Dark violet in color with a rich nose of berry, coffee an herb. Mature and vibrant notes combined with firm and sweet tannins. Long persistence, concentrated and elegant. "A lithe and minerally red, with good cut to the red plum, dried raspberry and wild herb flavors. Peppery accents emerge on the fresh finish. Drink now through 2021." "(vinified and aged in stainless steel and epoxy-lined concrete tanks): Dark red-ruby. Perfumed aromas of blackberry, tobacco and licorice, plus a whiff of gamey reduction that carries through onto the palate. Supple dark berry flavors show good concentration and convey a rather low-acid impression. Finishes uncompromisingly dry but easy to drink."